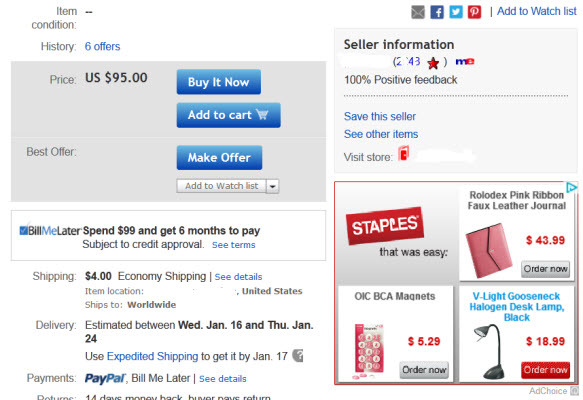 On Friday afternoon, I came across an ad on an eBay Item page for retail chain store Staples. What was most remarkable about the ad was that it led directly from an eBay seller's product listing to an item for sale on the Staples website, complete with a Staples "add to cart" button. The single ad actually featured three different products, each with a link directly to a product page on Staples. The ad included a picture of each product along with the price and an "order now" button for each product. 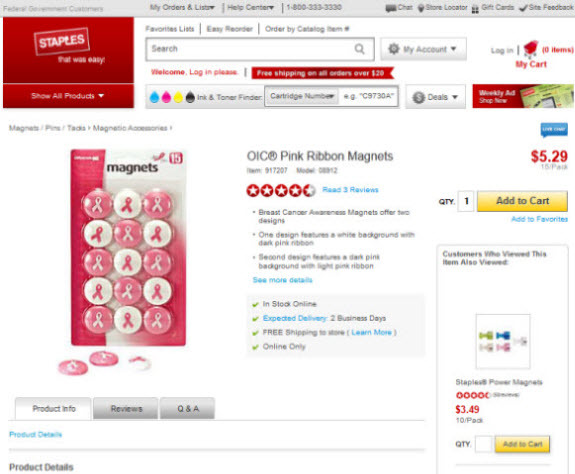 I clicked on the "order now" button for a package of magnets, and it took me to the product page on Staples where I could see more information and click on the Add to Cart button. I went back to eBay to see if any sellers offered the magnets for sale, and there were three listings for multi-packs. The other two items for sale in the ad were a Rolodex Pink Ribbon Faux Leather Journal and a V-Light Gooseneck Halogen Desk Lamp, Black, and the ad also linked directly to those product listing pages on Staples. I've seen plenty of ads on eBay Item pages, many for eBay "house ads" or for brands such as Verizon, but not ads that take shoppers directly to another product listing on a competitor's site. In May, eBay spokesperson Johnna Hoff said the ads that had begun appearing on Item pages would be almost exclusively in the realm of brand advertising "meant to increase awareness of popular, reputable brands and cement in buyers' minds that eBay is a trusted shopping destination." She said the purpose of the ads was not to compete with sellers, but rather, to bring additional value to the View Item page. eBay has been running ads on eBay UK since 2010 that do direct shoppers to other retail websites, including Fab, Hayneedle, Best Buy, Walmart, Amazon - and Staples. The ad I saw today takes eBay's hosted advertising to a whole new level. Let us know what you think and if you've spotted such ads on your listings. "In May, eBay spokesperson Johnna Hoff said the ads that had begun appearing on Item pages would be almost exclusively in the realm of brand advertising ..."
Well, she did say "almost exclusively". And, how can you tell when an eBay/PayPal representative is lying? Their lips are moving! It's all about the stock and appeasing Wall Street. Expect to see more Bain & ebay vested interests in the way of ads on all sellers pages. "[Hoff] said the purpose of the ads was not to compete with sellers, but rather, to bring additional value to the View Item page." Call me crazy, but taking potential buyers away from a seller's listing to an off-site retailer sure seems like competition to me. I would be livid if I was paying for a listing and eBay shoehorned one of those ads into my space. EBays disfunction has just about reached critical mass. It is beginning to fail in a big way. What a fool.... Johnna Hoff must also accept the premise that network TV viewers tune in to watch the commercials. Well, if they are plonking a Staples ad on your page can you at least hope that potential buyers are going to see your page before they go to Staples? Regardless, it's "logic" that could otherwise only be found in an institution for the insane ... so, what new? That reminds me, has Ms Hoff yet responded to Ina's question about the reason for the watering down of the Shill Bidding policy in the US only? Ok Small Fry, step aside. The customer wants to spend some money. Thanks for attracting the fly with your little piece of... bait. Now go list some more. eBa'al and Staples will take that money that would have gone to the rare appearance of a customer in your eBa'al store. Jump through all sorts of hoops to get a ''discount'' and better placement in ''Search'' and then eBa'al - YOUR BOSS, pulls the football away from your charging Charlie Brown. eBa'al is ripping you off, aren't they? They make you operate to a much higher level of customer satisfaction than any other establishment. Yet it is all right for eBa'al to walk all over you, the seller paying the bills, and when they are done walking on you, they wipe the soles of their shoes on your face. ''There isn't any place better.'' That's why people keep listing here. Then sellers wonder why buyers have no respect for them. Do your friends and cow orkers sell on eBay? Get a new money source to join and you can have 5 free listings!!! eBa'al - More Value, Greater FUn. ebay math: "additional value to the View Item page" + "taking a credit instead of cash for the things you sell on eBay" = You lose. "She said the purpose of the ads was not to compete with sellers, but rather, to bring additional value to the View Item page." The cost-per-click that eBay receives for those ads must be a penny or so more than the FVF + PP transaction fee. Obviously, the extra penny in profit is more important that building a sustainable base of thriving sellers. It's all about next quarter's bottom line... NOT in building or strengthening the eBay sellers. EBAY IS CHIPPING AWAY AT THE FOUNDATION OF ITS OWN CASTLE WALLS! eBay execs are doing this so that they can use the gravel and rubble to make outward improvements to their castle. They destroy from within to build thicker battlements, wider parapets, larger keeps, and taller towers with ornate spires. This castle is an impressive-looking sight from a distance. All challengers who approach from the RIVER VALLEY side would surely be intimidated and abandon their quest! It would be logical to assume that such splendor and grandeur can only represent great strength and power. BUT DON'T LOOK TOO CLOSE!! Do not confuse the mere appearance of ''strength and power'' as being the same thing as ''wisdom and vision''. Challengers who approach the castle from the WOODS & HILLS would easily discover what a fragile and vulnerable place this castle really is. The foundation is crumbling... the walls are sagging... the moat is dry, the crenels are gone. Peek inside the castle walls to discover the well has run dry, the latrine overflows, barnyard animals roam freely because even the stable doors have been salvaged to make shingles for the spires. Those who reside inside are weak and struggling with illness and disease. THINGS ARE NOT AS THEY APPEAR!! What do I think? I think it stinks!...but, sadly, none of us are surprised. Ebay sinks lower and lower every day! Tell me we are now not in a BAIN WORLD- I want NOTHING TO DO with Bain & Co! Ina please GIVE US A LIST of companies that accept PP so we can all boycott them. WE PAY SPECIFIC FEES FOR THAT SPACE and if ebay says WE cannot do it than THEY SHOULD NOT BE ABLE TO DO IT! We are TOLD we cannot do that and then EBAY does it to us on OUR OWN ADS for THE COMPETITION!!!! It's hard to figure out what eBay's long game is when they incite people to leave their own marketplace to shop elsewhere, typically a large big box type retailer. One can only deduce that their ultimate aim is to forge relationships with those retailers in order to establish their payment services (i.e. Pay Pal) as the way to transact purchases with those large retailers. Personally, I think that Donahoe has decided that eBay's future is as a payments service, which explains their focus on mobile shopping. If that is the case, their strategy is really risky, as I don't see any major barriers to competitive entry on the part of other payment services - I can't see Visa or Master Card taking this lying down. I just think that Donahoe wasn't up to the task of making the marketplace work. You can see that everything that they do is focused on extracting any revenue growth by nickel and dime-ing their user base rather than investing in infrastructure that would help sellers transact and market their offerings. Just my opinion. Instead of building on an already successful marketplace, Donahoe disrupted and tore it apart. He seems to have no idea how to make a business thrive. JD reminds me of a bully walking along a beach and destroying kids sandcastles. He probably is one to level historical buildings instead of restoring them to their original beauty. Hoff should have said the TRUTH- that it bringrs greater value ($) TO EBAY. Now THAT's the TRUTH Ms. Hoff. Cassini would seem to represent a large investment in infrastructure on the part of ebay. Unfortunately, it doesn't sound like a successful investment at this juncture, but it is definitely a large one. Gee how does that woman sleep? What does bring additional value to the page mean?